The biannual 5x5 Project brings 25 contemporary artworks to the streets, buildings and even sidewalks of D.C.
Or perhaps you’ve noticed the kaleidoscopic building on 13th and H in Northeast that combines American icons with their Iranian counterparts. And then there is the infamous “junk” installation in Anacostia that angered Councilmember Marion Barry and some of his constituents in Ward 8. Those pieces and many more are scattered throughout the city as part of the biannual 5×5 Project, which brings 25 contemporary artworks to the streets, buildings and even sidewalks of D.C.
5×5 started two years ago, at the behest of the D.C. Commission on the Arts and Humanities. 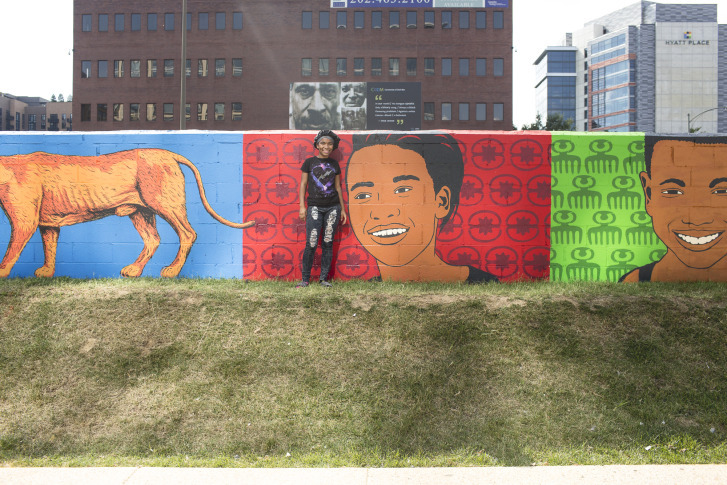 The idea was to spread art into every ward in the District as a kind of democratization. Following unrest in Ferguson, Missouri — where an unarmed black teen was killed by a police officer — “Bridge” can be seen as a conduit for change. “To me in the capital, in terms of the importance of raising this dialogue, in a region of policymakers, is something that’s very vital, especially now in context with what’s going on not only in the world, but here in the country,” Kaino tells Forbes. When that installation was added to 5×5 more than a year ago, the events in Ferguson had not yet happened. But now that the dialogue has started, “Ceremonies of Black Men” feels more relevant than ever, a sign that art always has a place in daily life, Massey says. “It’s a conversation we want to be having, and we think that everybody in the District, and, really everybody in the country, should be having about how we look on people in our society and how we treat them,” she says. 5×5 runs through December in various parts of the city. The next round of events will be held at the National Museum of Women in the Arts. Click here for a full schedule.